Included below are the two Woolwich History books by William Thomas Vincent. They were originally published in 1890, and have recently been republished by FamLoc, and are avilable in print and ebook format. We also include other Woolwich books of interest, as well as the excellent Godfrey Maps. There are extracts and images further down this page. We welcome suggestions for other Woolwich history books. We would very much like to republish The Woolwich Story, by E.F.E. Jefferson, originally printed in 1970 and reprinted in 1981. Are you the copyright owner, or do you know who is? We are interested in re-publishing all Woolwich history books and pamphlets. 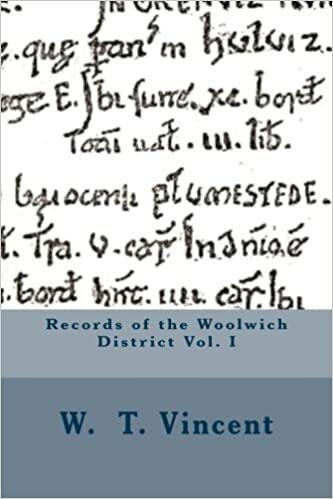 Originally published in 1890, this FamLoc edition of Records of the Woolwich District Vol I is a slight modification; there have been changes to format and punctuation, especially in respect of the many quotations. However, the prose has been faithfully retained, other than changes to a handful of typographical errors and the very few instances where clarity was required. Records of the Woolwich District vol. I consists of more than 570 pages, and over 200 illustrations, plus 45 photographic portraits of local men of influence, this book includes many old maps, is rich in the main institutions of churches, schools, charities and industries, and also includes topography, and notable events, making it invaluable for the local historian, family historian, and others with connections to the area around Woolwich. Although there was no concept of Social History in 1890, Vincent comes closer than most of his contemporaries in considering the condition of the majority of the people. The book is rich in the main institutions: churches, schools, charities and industries – especially the Woolwich Dockyard and Arsenal, and also includes topography, origins of street names, notable events, and people of influence. 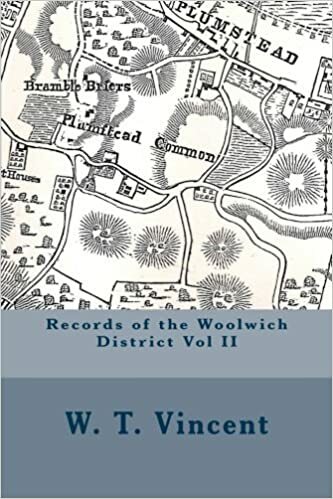 The detailed information makes “Records of the Woolwich District” invaluable for local historians, family historians, and others with Woolwich connections. First published in 1890, this first volume of William Thomas Vincent’s two Woolwich history books, “The Records of the Woolwich District” is concerned almost entirely with Woolwich, in south-east London. It includes over 150 illustrations, plus 108 photographic portraits of local men of influence. Although there was no concept of Social History in 1890, Vincent comes closer than most of his contemporaries in considering the condition of the majority of the people. The book is rich in the main institutions: churches, schools, charities and industries – especially the Woolwich Dockyard and Arsenal, and also includes topography, origins of street names, notable events, and people of influence. This makes it invaluable for the local- and family historian, containing much detailed information. “In the Half-Lath of Sudtone, in Greenviz Hundred, Haimo has there sixty-three acres of land which pertain to HULVIZ. William the Falconer held it of King Edward. There are eleven bordars there, rendering forty-one pence. The whole is worth three pounds. (In Litelai Hundred) the Abbot of St Augustine holds of the Bishop of Baieux PLUMSTEDE. It answers for two sulings and one yoke. There is the arable land of five teams. In demesne there is one team. And seventeen villans with three bordars have four teams. Wood there of five hogs. In the time of King Edward it was worth ten pounds. When he received it, eight pounds. And now as much. And yet the tenant renders twelve pounds. Brixi Cilt held it of King Edward. There had long been a ferry at Woolwich across the Thames. There were also boat transport along the Thames. This increased with the coming of steam boats. Hog Lane (Nile Street), left, was partly demolished for the Free Ferry, 1887-8. A Naiad, Nymph, and Fairy. Powis Street, the most central and important thoroughfare of modern Woolwich, commenced to exist only at the beginning of this century. It was laid out as part of the Bowater estate purchased by the Powises, a family of brewers at Greenwich, about 1800. The Powis family still hold the property. Thomas Street, William Street, Richard Street (which is now absorbed in Hare Street), and Charles Street were named after members of the Powis family. Eleanor Road and Monk Street have a similar origin, but are of later date (about 1860). Brewer Street commemorates the family trade. Rectory Place, and the streets to the north, were built on the Glebe or Rectory land about 1820. Rectory Grove occupies the garden of Grove House. St Mary Street was on the Glebe, and is named after the church. Parson’s Hill was the hill just opposite the old Parsonage by the river. Mulgrave Place was one of the first streets to appear when the town began to expand in 1810. It bears the name of Earl Mulgrave, the then Master-General of the Ordnance. Wellington Street marks the date of its formation, about 1815-20, when the hero of Waterloo was at the height of his glory. Green’s End is the end of the green on which the Sappers drilled. Spray Street was laid out by a Mr Spray, about 1800 (see Burrage Estate map, under “Plumstead”). Helen Street, on the same estate, was named after Miss Helen Pattison. Mill Lane, formerly Cholic Lane, was the high road to London, with a mill standing on the eastern side, in the place of the Royal Engineer Office until about 1860. “Rose Bank” adjoined, and Barrack Court occupied the site of the Auxiliary and Female Hospitals about 1850. Cholic Lane bore its old name until 1830. New Road was made about 1790 to connect Plumstead Road with Cholic Lane, the line of traffic having previously been carried round Green’s End. The White Gate was opposite Barrack Court. The road to this spot from the Barracks was laid out after 1810, when it was only a footpath. Nightingale Place was until 1850 known as “Ditchwater Lane,” from the brook which ran across it and under the hedges of Brookhill Park. Nightingale Vale owes its name to the “feathered choir,” which made music in the valley. Sandy Hill was a footpath deep in sand until the Board of Commissioners made the road about 1848 upon a tough foundation of faggots. “The poorhouse presented in our illustration (plate xviii, below) was accordingly built, and did its duty for more than a century. In the local act of 1808, previously quoted, authority was given to enlarge the workhouse or build a new one, as the structure was in many parts decayed, and insufficient for the accommodation and employment of the poor; but the authority was never exercised, and matters continued in the same way until Woolwich was taken into the Greenwich Union. Also published in 1890, this second volume of William Thomas Vincent’s two Woolwich history books, “The Records of the Woolwich District vol II” covers some more on Woolwich, but also includes a great deal about the surrounding locations of Abbey Wood, Bexley, Charlton, Eltham, Erith, Kidbrook, Plumstead, Shooters Hill, Welling, and Wickham. It includes over 200 illustrations, plus 45 photographic portraits of local men of influence. The book includes many old maps, is rich in the main institutions of churches, schools, charities and industries, and also includes topography, and notable events. This makes it invaluable for the local and family historian. We are always looking for Woolwich history books we can display and perhaps turn into eBooks. Please contact us if you have info.